Advent is a season of expectation. The image of a brilliant star shining down over a quiet forest with word the "Love" appearing as the focus of the bulletin cover. 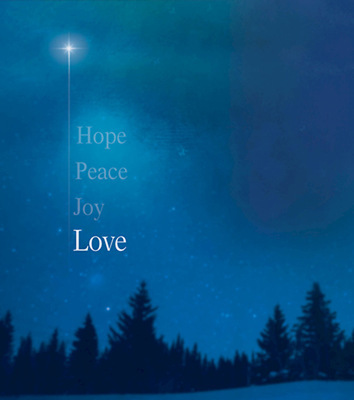 "Joy joins "Hope," "Peace,"and "Joy" to help your congregation continue connecting with the feelings of anticipation and reflection during this season leading up to Christmas. The bulletin is shown folded (8.5" x 7"), exactly as church members and visitors will receive it. Worship bulletins arrive packaged flat 8.5" x 14" to fit into your printer or copier; shrink wrapped in packages of 50. Also available as a regular size bulletin.